The AGC Supervisory Training Program (STP) is designed to meet the specific needs of the early-career construction supervisor. 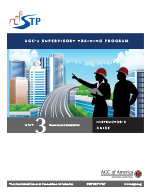 The Heavy/Highway Construction Supervisor Overview Unit, 3rd Edition, describes the value of effective workers to improve the supervisor's abilities. Unit HH focuses on the heavy and highway supervisors and covers: attributes of a heavy/highway supervisor, company responsibilities, problem solving, cost awareness, planning and organizing, accident prevention and loss control, and much more. This Instructor's Guide assists course instructors in leading participants through course discussions and activities. Learn more about the entire program at www.agc.org/STP or by emailing curriculum@agc.org.